I can’t think of one frugal thing that I did this week. I did do a lot of other things, however. So I guess I’ll just tell you about all those things instead. Sunday was our Zeytuna’s 17th birthday party and Wednesday John and I took her out to dinner and a movie, which is a tradition at our house. We saw The Maze Runner, which was kinda violent, but had (I thought) an intriguing story line. We enjoyed it. 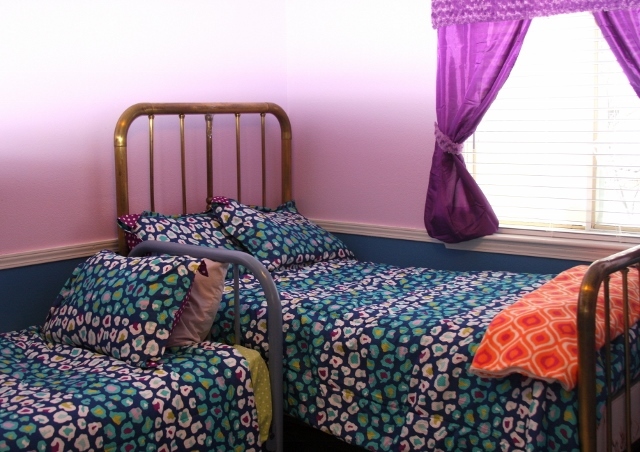 Monday I took Emily and Julianna out to pick out paint and new bedspreads for their room.They’d been begging for new paint in their room for a good long time as there were lots of chips and they were itching to try out some new colors in the room. 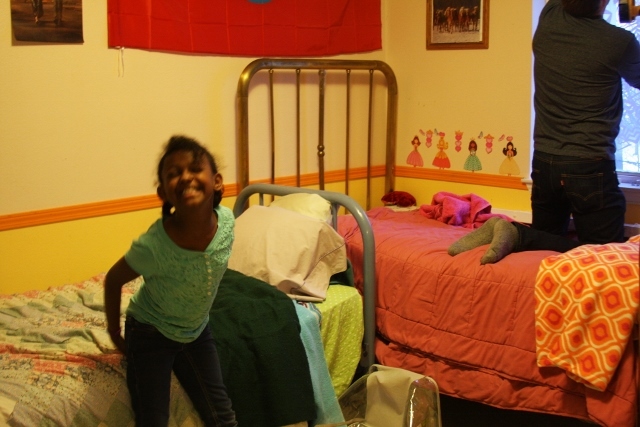 They had Christmas money to spend, which purchased the bedspreads– hooray! !– and I bought two colors of paint and a new shade for their window. Here’s how it looked a few days ago, with Julianna buzzing with excitement and John busily installing the shade. 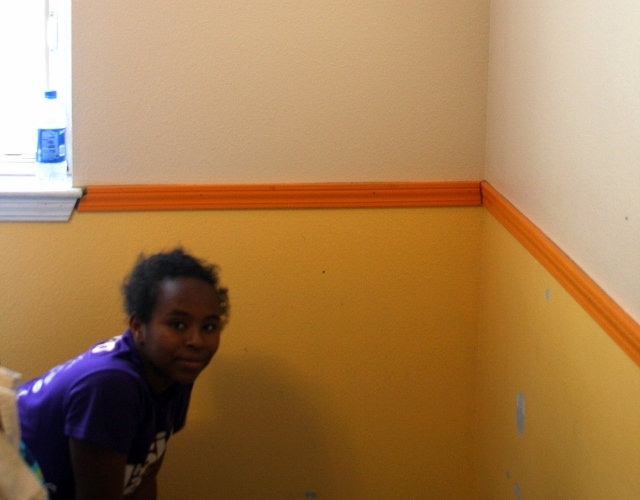 Here’s Emily washing baseboards and laying down blue tape at the edges. 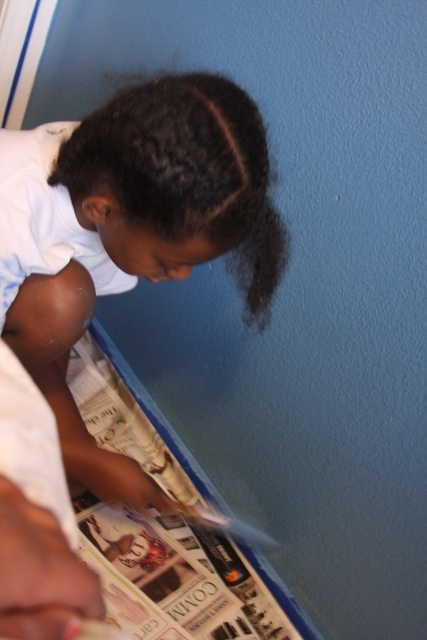 And here’s Julianna painting away. She and Emily were both thrilled to help out with this project. Tuesday was spent first moving beds, then cleaning up all the stuff we’d unearthed from under the beds, and then finally painting. Whew. What a job. It actually stretched partway into Wednesday, and I was very grateful that John painted the white trim for us, since I was sick of painting by then. As you can see, it turned out really cute. It’s a delight to peek into their room now! 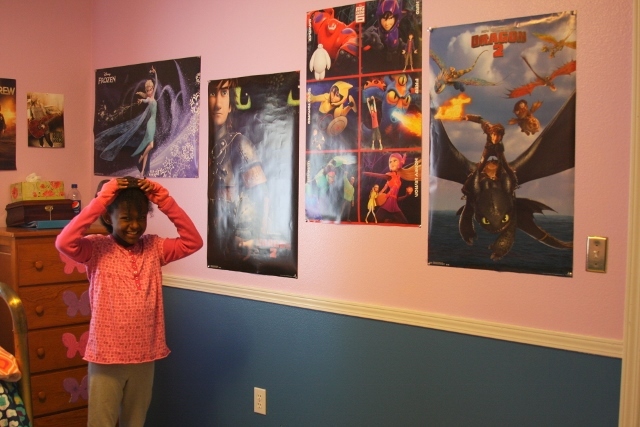 They especially love their poster wall, installed strategically across from the beds so that they can both see them all. Lots of fun! On Wednesday, John got my new baby gate painted and mounted on hinges at the bottom of the stairs. We opted to distress the white paint, and then added a layer of poly for extra protection. As you can see, it sits snug against the wall when it’s not needed. And here it is, swung shut. 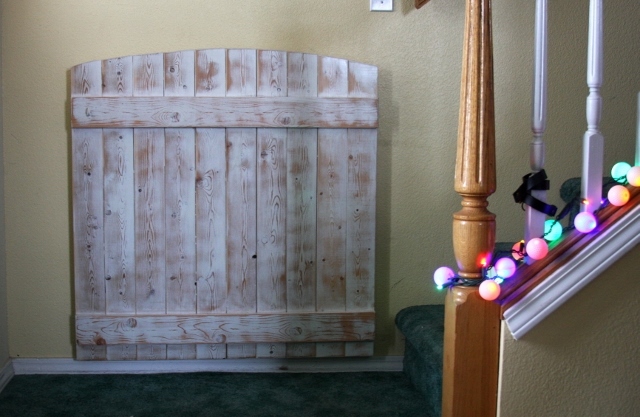 I think it turned out really cute, and it’ll be nice to have a permanently mounted gate that we can easily shut when we don’t want the little kids climbing the stairs. On Thursday I went over to Amanda’s house, and helped her sort and organize baby clothes into bins by size. With baby #3 coming in April, she is working to make space and keep the house functioning well with another little one added into the mix. Very fun. On Thursday I also got some new shades from amazon to go in my bedroom. 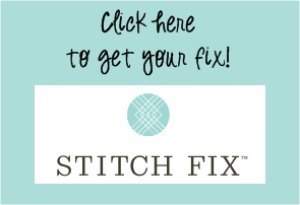 They are pleated shades that have no strings– so neat and easy. It was very nice to throw away my dusty beat up old ones and replace them with something crisp and new. Then today I began the day by taking Emily and Julianna to the rec center to meet Amanda and Erika and all the grandbabies for a swim. They’re the only people in the world that I’d don a swimsuit in January for, that’s for sure. We had lots of fun, and ended with lunch at Panda Express. Monday starts school again, though I don’t think any of us are quite ready for Christmas break to be done. How did your week go? Feel free to comment below and tell me how your frugality efforts went — hopefully a lot better than mine! There is an outdoor skating rink in our town, for the second year. It is free for anyone who wants to come. Last year, the kids wrote a thank you note to the mayor stating how much they enjoy using the skating rink. They then hand-delivered it to the town office. He said he would show the letter to the next meeting, since they never get thank you notes. Maybe the kid’s letter contributed to having another skating rink this year. That was a great experience for the kids to get such nice feedback, I bet! Super cute makeover in the bedroom and great baby gate!! 1. Found a new grocery rebate app called Snap which is part of Groupon. It is for any grocery store and every week has several fresh fruit/ veg offers as well as a basic like milk or bread. In my first 2 weeks I have $2.50 in my account and the great thing is last week I got $1 for milk and then I also got 25¢ from Ibotta for the same milk purchase. I have a referral link if anyone is interested. 2. Aldi’s had 10 lb. bags of potatoes marked to $1.00 because a few of the potatoes had just started to sprout. I bought a bag even though I didn’t really need potatoes. I brought them home pulled off the eyes and have been committed to eating them and not letting them go to waste. We’ve had scalloped potatoes, boiled potatoes with butter and chives, baked potatoes, potato soup and I’m making potato skins for the football game. I also got a 25¢ rebate with my SNAP App. 3. My son will be going off to college in the fall, over 500 miles away! I am just starting to gather items to put together a survival kit for him living in a dorm. I bought a flashlight and a new paring knife at a church sale last month and this week I got him pair of scissors. Office Depot had them on sale for $2: I bought the same pair a year ago at back to school time and love how they cut so was happy to find them at such a great price. 4. Found a pair of Ann Taylor black dress pants, with the tags still on at the hospice charity shop. Originally $98, marked $6 but that color tag was 1/2 off so only $3 and they are petite too! 5. Went to the Indoor flea market the Knights of Columbus has once a month. For $1 I got 4 Fiesta mugs that I will resell and a cute fabric bag full of clothes pins for 25¢. Glad to get the clothes pins because many of mine had finally bit the dust. Any instructions for the baby gate? 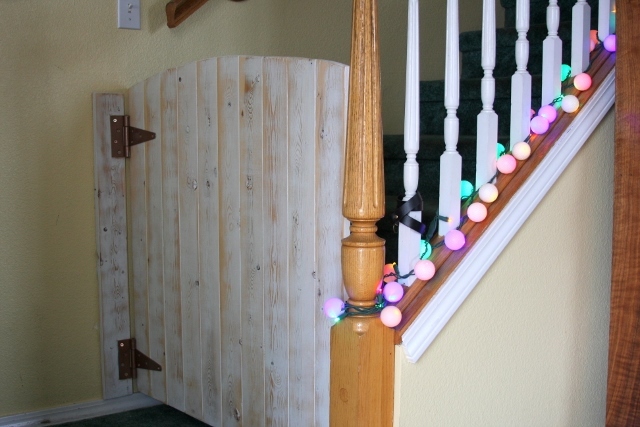 We have similar stair layouts and that would look much better than a typical gate. Not a lot here. I did do a 2 week menu (snacks, breakfast, lunch and dinner), went shopping and found awesome deals at Kroger and Aldi. I spent just under $200 for groceries that should last this family of 7 two weeks. ( I will need another gallon of milk). I also made 5 frozen meals for next week, so that I am not tempted to go through a drive- thru on the really hectic evenings. My large crock pot( crock) broke and I found a replacement at Goodwill for $5. What cute bedrooms! I have a meal plan done for the entire month. I got stocked up this weekend at two different stores with huge sales. I am hoping to keep my food costs around $450 for the month. Also, this is the ninth night we have eaten at home. I am trying to ban take-out!! Adorable room! It really is amazing how much a change of paint can really make everything looks so completely different.